Call and set up an appointment with Patsy to plan your portrait. Your ideas concerning the painting will be discussed at this time, such as size, colors, and mood. A schedule for sittings, photo session and color studies will be planned or we may use existing photos. Be sure to share information about the subject's personality and interests. A contract to commission the portrait is signed by the artist and purchaser at this meeting. The contract covers details of design, payments, ownership, privacy, termination, copyright, delivery, and repairs. A non-refundable 40% down payment is required at the approval of the preliminary design. The balance is due on completion plus any additional charges, such as special packing or crate and truck delivery. Please allow 3-6 months from planning to completion depending on complexity of the work. Satisfaction Guaranteed. 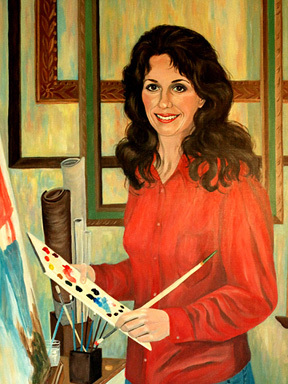 Portrait design is based on color study sittings and photographic studies made by Patsy at her studio or another location. Photographs provided by customer may also be used. These will help capture the best expression, lighting and pose of the subject. Posthumous portrait designs are based on candid family photos and customer thoughts. The frame is not included in the portrait fee, however Patsy will assist you in selecting the one that is appropriate from a large selection of elegant, exquisite gold frames. She would then proceed to custom frame your masterpiece. Free engraved nameplate is included with frame purchase. 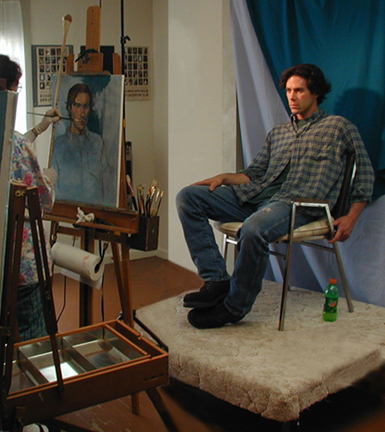 The following prices are for a traditional life-size oil portrait hand-painted on linen. Children prices are up to age 18. Half-length to waist with hands for adult. To knees or seated for child. Three-quarter length above knees or seated for adult. Full length for child. Consult artist for sizes & prices not listed above. * The above prices do not include the 5% sales tax (in Virginia), travel expenses for the artist, special shipping/truck delivery or framing costs.